South Africa got a rude awakening in 2016 when a massive drought brought the country to its knees. Once again, citizens were reminded how precious water is and what needs to be done to preserve this vital resource. Radical Waters is aiding the fight to minimize the water footprint by means of innovative technology and sustainable solutions. The company has taken the industry by storm with the introduction of alternative products to harsh chemicals such as caustic and bleach that go a long way in saving water and time. ECA (electro-chemical activation) is made with water, salt and electricity in a specialized machine, and produced on-site to disinfect and clean. “Food and beverage factories use our products, Anolyte and Catholyte, instead of caustic and bleach. 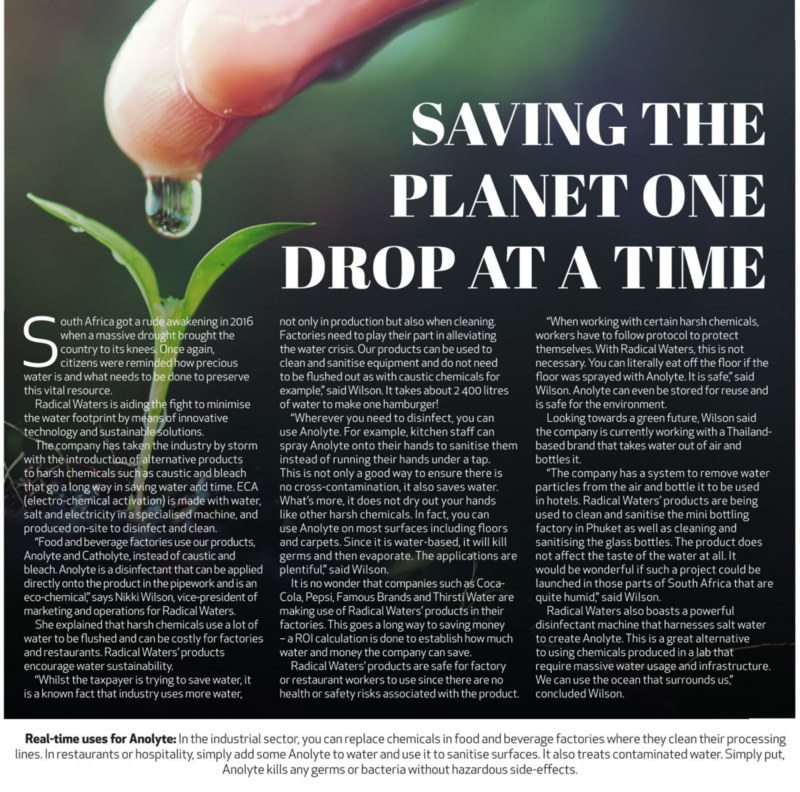 Anolyte is a disinfectant that can be applied directly onto the product in the pipework and is an eco-chemical” says Nikki Wilson, vice-president of marketing and operations for Radical Waters. She explained that harsh chemicals use a lot of water to be flushed and can be costly for factories and restaurants. Radical Waters’ products encourage water sustainability. “Whilst the taxpayer is trying to save water, it is a known fact that industry uses more water, not only in production but also when cleaning. Factories need to play their part in alleviating the water crisis. Our products can be used to clean and sanitize equipment and do not need to be flushed out as with caustic chemicals for examples.” said Wilson. It takes about 2,400 liters of water to make one hamburger! “Wherever you need to disinfect, you can use Anolyte. For example, kitchen staff can spray Anolyte onto their hands to sanitise them instead of running their hands under a tap. This is not only a good way to ensure there is no cross-contamination, it also saves water. What’s more, it does not dry out your hands like other harsh chemicals. In fact, you can use Anolyte on most surfaces including floors and carpets. Since it is water-based, it will kill germs and then evaporate. The applications are plentiful” said Wilson. It is no wonder that companies such as Coca-Cola, Pepsi, Famous Brands and Thirsti Water are making use of Radical Waters’ products in their factories. This goes a long way to saving money – a ROI calculation is done to establish how much water and money the company can save. Radical Waters’ products are safe for factory or restaurant workers to use since there are no health or safety risks associated with the product. “When working with certain harsh chemicals, workers have to follow protocol to protect themselves. With Radical Waters, this is not necessary. You can literally eat off the floor if the floor was sprayed with Anolyte. It is safe” said Wilson. Anolyte can even be stored for reuse and is safe for the environment. Looking towards a green future, Wilson said the company is currently working with a Thailand-based brand that takes water out of air and bottles it. “The company has a system to remove water particles from the air and bottle it to be used in hotels. Radical Waters’ products are being used to clean and sanitise the mini bottling factory in Phuket as well as cleaning and sanitising the glass bottles. The product does not affect the taste of the water at all. It would be wonderful if such a project could be launched in those parts of South Africa that are quite humid” said Wilson. Radical Waters also boasts a powerful disinfectant machine that harnesses salt water to create Anolyte. “This is a great alternative to using chemicals produced in a lab that require massive water usage and infrastructure. We can use the ocean that surrounds us” concluded Wilson. This entry was posted in Industry Articles, Media Articles. Bookmark the permalink. ← Our Electrolysed Water products are now being used in a vast range of markets which were formerly dependent on chemicals for controlling contamination and bacterial infection.